Several of the slings shown in the gallery are custom slings -- made from fabric that was sent to me by customers looking for something a little less vanilla than my current in-stock fabrics. These include two-layer slings, sewn of silk/rayon brocades and silk linings, as well as simpler slings made of material I just don't have on hand. Here are some reliable sources for fabric. Please note: I strongly recommend against using calico/quilting cottons in a single layer. For one thing, the tight weave makes it a lot less comfortable than other fabrics; and for another, calico/quilting cottons are not intended for weight-bearing functions. (Please read my fabric FAQ for more information.) If you would like a sling using the calico as a tail accent on sturdier fabric, I will be happy to accomodate you. If you choose to use a single layer of calico anyway, I must completely disclaim liability for any rips or tears that occur when the sling is used. 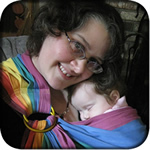 If you're interested in a double layer sling, I would recommend contacting Christie at Sweet Pea Ring Slings -- she does beautiful work, and her double layer design is very clever and comfortable. Please email me before buying and/or sending your fabric. For example, I like lightweight twill for a sling, but some twills are just too thick. I will make a final judgement about its suitability when it arrives, but I'd hate to have you pay to send it to me only to find it won't make a good sling. See this page for sizing information, then add at least 6" to account for shrinkage, plus the fabric that is looped where it goes through the rings (3"). Most online fabric sellers deal only in whole numbers, so if you find that you need 78", it's likely you'll have to round up to 3 yards (108"). However, you may find that they will sell in 1/2 yard increments (in which case you could order 2.5 yards, or 90"); please check their policies when ordering. Brick and mortar retailers like Hancock or JoAnn Fabrics will allow you to buy the actual amount you need -- in the example, that would be about 84". I can use the excess yardage to add pockets, or make a snap-on bag for your sling, or just send it back to you. Please make a note of the weight of your fabric if you want the extra material sent back to you. Heavier fabrics cost me more to mail back. Email me if you're you're ordering it online and are not sure how heavy the fabric will be. By this I mean the physical weight and bulk of the fabric. Some fabrics, like silk, are very lightweight and compact; others, like polar fleece and many bottomweights, are either bulky or heavy or both. If you want the scrap pieces returned to you, I will need to pay the actual shipping cost, and I prefer not to pay that out of pocket. If you pay $9 to send the material to me, it's going to cost me at least that much to send them back. I will likely get your completed sling in the mail for you within the range that's specified at the top of the screen (under "This week's message"), after I receive your fabric. My workload varies, but turnaround has been in the 3-7 business day range for the last couple of months. I cannot accept returns on custom-fabric slings. I strongly recommend that you email me with details about your fabric if there is any question about its suitability, since I cannot take responsibility for the fabric you have purchased.